This meal at L’Arpège could be perceived as a crash or a triumph depending on who you are as a diner. A crash if you think of a restaurant as that robot that’s supposed to read in your mind and feed you with the exact bites you want, which I think would be a naïve approach to dining. A triumph if you understand that a meal needs to be judged on the back of the heights it can reach, not in terms of this is good, that is less good and that is a bit better. Then, there’s also this important observation to make: there’s a reason some restaurants deserve their rank as a 3 star Michelin (needless to stress that this is a strong 3 star when it ‘’touches the sky’’’ as it did on that meal. Thinking otherwise would reveal a deep lack in the understanding of what cooking should really be about). And that reason is the same that makes a Porsche, a Lamborghini or a Ferrari all well praised cars: the details! You can love or hate them, but it does not matter, as at the end of the day …they are effortlessly capable of heights, here and there, that their peers can only dream of ! Before getting to the point, just a quick overview of some of the latest main changes in France’s restaurant scene: as most know, Yannick Alléno has left Le Meurice (this was not a surprise since it was no secret that Chef Alléno was looking for some new challenge). 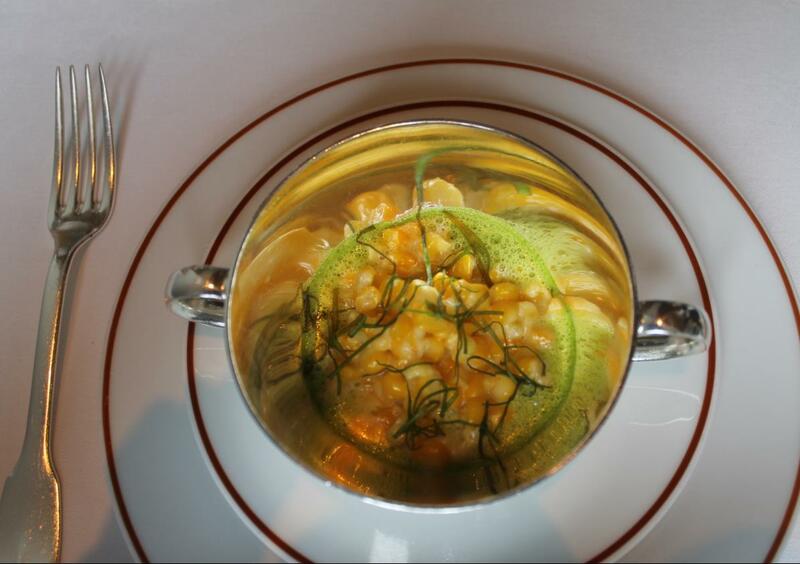 It will be interesting to see if Le Meurice will keep its 3 stars when next year’s Michelin stars will be published (though, according to Gilles Pudlowski, Le Meurice will benefit from Alain Ducasse’s association — click here for that article) . Not that I will miss Yannick Alléno (I am not a big fan of Chef Yannick Alléno), but he at least has proven to be capable of pulling off proper French haute 3 star Michelin standards . The legendary Marc Veyrat, a chef that I never had the chance to get to know, made a comeback (See Gilles Pudlowski’s article on the return of Chef Veyrat). In an article of Le Figaro about the 2013 Michelin stars of France, the article can be found here, my attention went to a comment from Cath98. She writes about the elitism of most of those Michelin star Chefs, which is actually not the reason I mention her comment here (people always think that what others do wrong is elitism/bad/etc, then when they get to replace the wrong ones, they inevitably end up doing the same thing… but done differently..lol…one elite is always replaced by another..elite,…if you have hard time getting this, think of Fidel Castro –he was reproaching Battista to stick to power..humm….. ). What I found interesting though is her comment about the militant-less attitude of most of those big Chefs. She is absolutely right: how on earth, do you rise to such heights and have just the average BS speech about terroir/local produce to content yourself with? I am all for the terroir, have fought for it since my tender age, but we all got this one by now! In the UK, a chef like Gordon Ramsay fights for wise fishing (ref: his actions against abusive shark consumption). 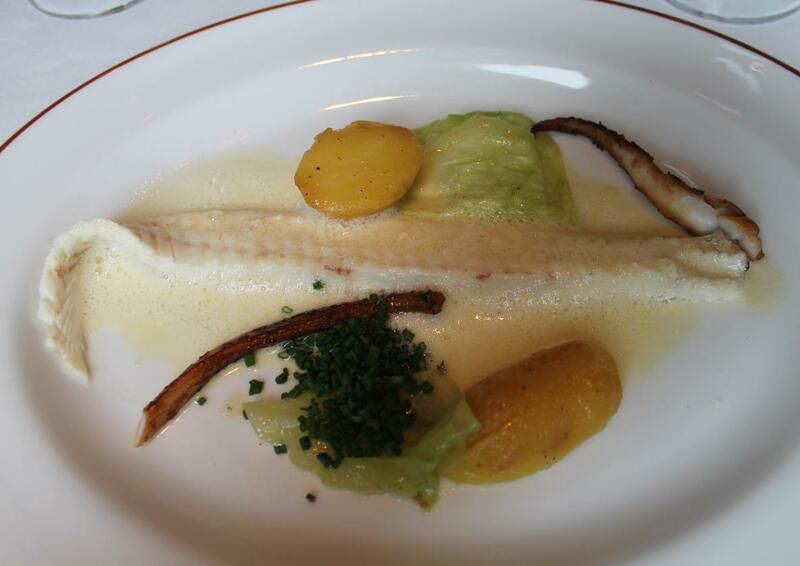 So, Michelin star Chefs, especially in France: ” au violon, il est temps de jouer d’autres airs …svp“”! 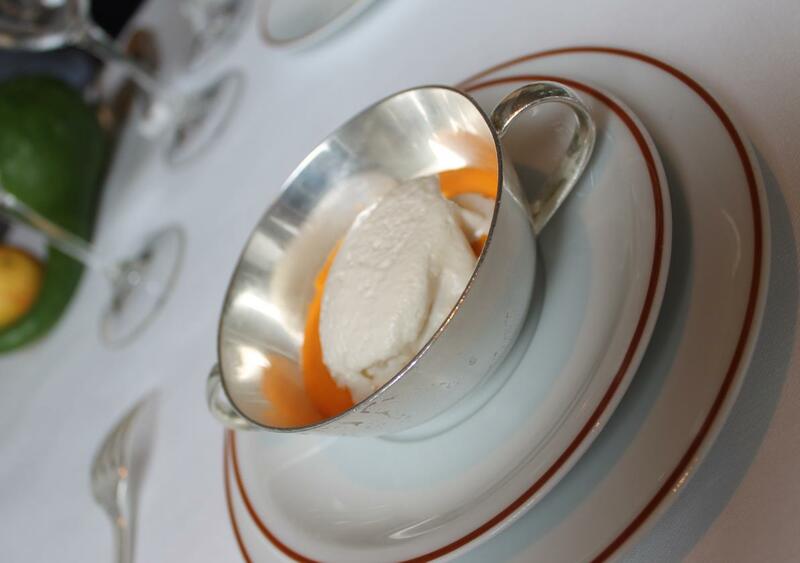 One last note in the “off-record’ section of this post: I need to drop a few lines on one of the best interviews a Chef ever offered: it is one that Chef Guy Savoy had with Agents d’entretien. You can find that interview here. Guy Savoy has always been a first rate human being, the Mahatma Ghandi of the stoves, a monument of positive vibes and that review will inspire many, not only those interested in food. Paris remains one of world’s REAL finest gourmand destinations, indeed – With the incredible exciting gourmand destinations like San Sebastian, Barcelona, San Francisco, Madrid, Rome, Tokyo, London, Hong Kong, stunning non upscale food that can be found in Ecuador, Taiwan, Malaysia, I was starting to fear that my dear Paris just could not handle a candle anymore to its world gourmand competitors. But the 4 recent visits here is re-assuring: for sure, if you do no search at all and simply push open the door of whatever eatery you find on your way, you will inevitably be disappointed. Do not forget: this is one of the most visited cities of the globe, so fake cooks abound to grab their share of the cake. On the other hand, Paris finest eateries easily justify the position of Paris as still a REAL world gourmet destination, and I’ll name a few that have absolutely seduced me recently, on my 2,3 recent visits to Paris: La Table D’Aki (Chef Aki was the fish cook at 3 star Michelin L’Ambroisie for the past 20 years. He now has his own fish-centric bistrot where the technique remains 3 stars for anyone seriously familiar with the matter, the setting is of the bistrot type and I find the price reasonable given both the quality of the produce and skills . This, for me, along with Bistrot La Marine in Cagnes sur Mer, is currently the idea of what I have of a #1 seafood French classic bistrot anywhere around the globe), Officina Schenatti (one of the finest Italian bistrots outside of Italy. No surprise here: Chef Ivan Schenatti has been, for a long time, the mastermind behind Emporio Armani’s haute dining. He now has has his own little bistrot with bona fide skills oozing where it should: in the plates. To continue with the theme of the great Chefs who are enoughly humble and respect their customers (they are the few remaining GREAT ones who are found where they are expected: in their kitchen instead of showing off huge ego by delegating their incapacity to work seriously to name bearers), I’ll drop a word on the very popular L’Ami Jean: there is nothing like this anyhwhere else around the globe. YES, it is full of tourists, barely no locals. But who cares?? It is the food, ….! Rfaol! I love Chef Stéphane Jégo rustic food, because when his rustic rich French basque-inspire food is in its prime (not always, based on my experiences there) , it is divinely delicious. That is all that counts for me. The hordes of tourists have obviously got it. And locals do not flock here because it is a bit too $$$ for most French. I am no exception: it is $$ for me too, but I’d rather wait and spare a bit of money, eat a great rustic bistrot meal here, once in a long while, rather than attending several laughable attempts at what a bistrot might be. L’Ami Jean has its drawbacks and they need to be repeated to anyone that does not know this: it is cramped, it is noisy, it is not the best place for a romantic meal. But I love it! Another keepers: Restaurant Kei as well as Le Sergent recruteur . 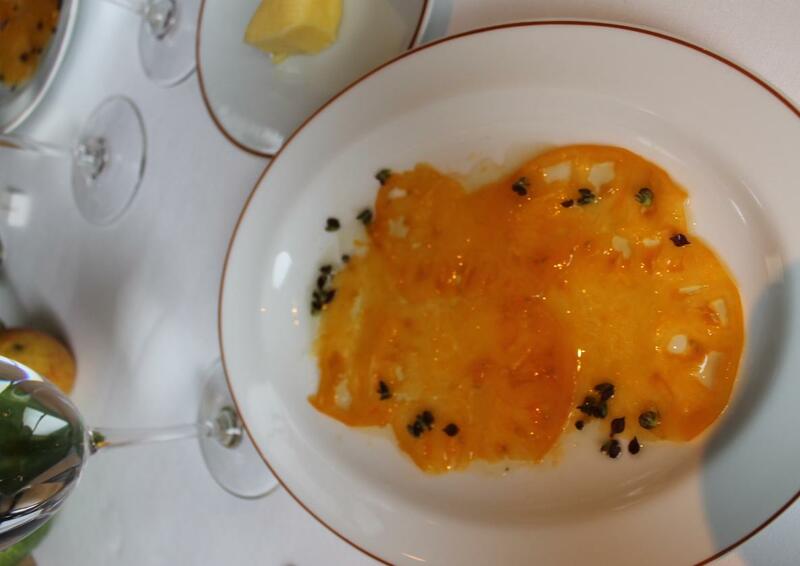 I should not hijack this article on L’Arpège to those findings, but to be brief, other findings that make of Paris one of world’s very best: Sola (A 1 star Michelin that would be 2 or 3 anywhere else; needless to add more. But what a gem of world class Japanese/French cooking and there is more to this place), the Pithivier of Eric Briffard at Le Cinq (Le Cinq is a real 3 star Michelin that has officially just 2 stars) , the Lièvre à la royale of Pierre Gagnaire/Senderens (remember: the best of French classic food being rich by nature, it shines in its full glory during game season). Nah, you won’t find anything close to those anywhere else. Last but not least, one of world’s current most talent Chefs, David Toutain, seem to be interested by a return on the food scene. 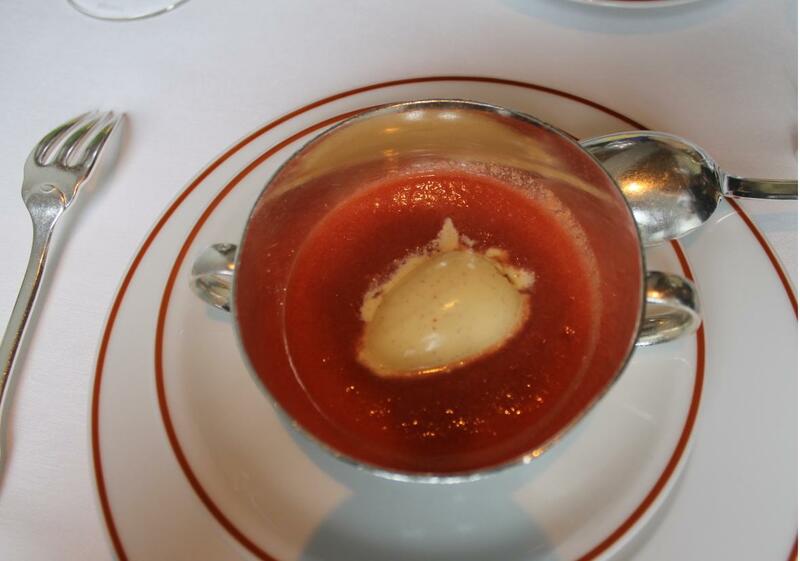 Back to my homeland (France) re-visiting L’Arpège (4th visit only in 15 years), as well as another 3 star Michelin place that was reviewed later, le Louis XV. The importance of the ‘gesture’ (IOTG) in cooking has long been pioneered by Chef Alain Passard (no need to introduce Chef Passard, which second grand passions are music and arts/ just google his name and you’ll have plenty of infos on one of France’s most celebrated Chef, whose restaurant L’Arpège – named after the musical technique called arpeggio — has kept its 3 Michelin stars since 1996). What passes as pure BS for plenty of lesser cooks, oftently because they just can’t bother understanding its deep meaning, is actually one of the most important concepts in cooking: like it or not, the eye, the touch, the feel, the smell set apart the better Chefs from the lesser ones. Many will tell you that they know all of that, alas few do really have the right eye/feel/smell and touch (which obviously explains why most restaurants have average cooks) and it’s easy, given that you are interested in such details (which I hope you do if you decided to take a chance on such pricey meals) , to perceive a developed sense of those matters: the end result will always end up as inspired (or not) as the care and deep ability of its creator to feel/touch/smell her/his produce. Fan or not of Alain Passard, there’s one thing you can’t reproach him: he is one of the few who genuinely walked the walk when it comes to the subject of the ‘importance of the gesture’ (The IOTG). Chef Passard, with whom my interractions have always been limited to a simply ‘hello Chef’ when he tours the dining room, is a Chef that I have read a lot about. But if I was a journalist, I would have some interesting material to cover with him. His genuine passion for vegetables is not just another refrain recited by yet another Chef. But it’s his views on the IOTG that has always caught my attention. Of course, parts of his views on the IOTG can be better understood by himself only: as an example, the way he moves his hands, the importance of the notion of distance in his movements, those are elements no one else than himself can really apply. But the IOTG is behind everything you want to do properly: take a tennis player for example. The way he/she moves his/her legs, the way he/she moves her/his arms, therefore the gesture, plays a significant role in his/her attitude, therefore his/her game. Same logic applies to food: the way you cut your meat, carefully or nervously, the way you pick that carrot, carefully or carelessly, the way you cook your food, patiently or hastily, will of course always affect the end result. There is a reason, in spite of nowadays need for speed, that I still insist on spending time with long hours of carefully slow cooking. The IOTG goes beyond the ability of feeling/smelling and having a great eye (essential for a real Chef) for your produce. You need, of course, to also understand the interaction between nature and the produce, you need to deeply understand how one specific ingredient reacts to an array of cooking techniques and temperatures. You need to understand the steps of the evolution of each single vegetable and fruit. You need to do the samething with meats, poultry, fish, etc. You need, and that is essential, to have memory of the flavors that were created before you. Or else, what are you really carrying on? What are you really improving upon? What can you be proud of if there’s nothing you can refer to ? All things that everyone seems to take for granted, but how many have REALLY proven to be capable of mastering those. How many cooks have bothered spending their time understanding and mastering the tastes of yesterday? How many really know, master and can reproduce the various traditional versions of a Lièvre à la Royale? How many are actually..real CHEFS, present for real in their kitchen? REAL great Chefs are rare nowadays and we obviously see why. The reason of the previous paragraphs is to explain why I keep going back to L’Arpège. Alain Passard is there in his restaurant, away from the syndrome of the fake cooks parading on TV. And he did and still do something simply amazing (again, my admiration for Chef passard has nothing to do with my appreciation of my meals here. I had great as well as less impressive meals here, as anyone can have great and less impressive ones at their favourite restaurants) : applying himself to transmit the real taste of yesterday to his brigade, then building — on that memory of taste – the creations of today. And they are doing it in an unusual way, their own way. Passard calling it his ‘cuisine légumière’ (they focus more on their work of the veggies than the average restaurants, with the veggies oftently the star, veggies that come directly from his own farms, the poultry or the seafood their equal, in contrast of the big majority of tables where the veggie is usually an afterthought, its presence serving as an accoutrement . Others have called it peasant food (for its mostly bold presentations and pure unfussy flavors) . 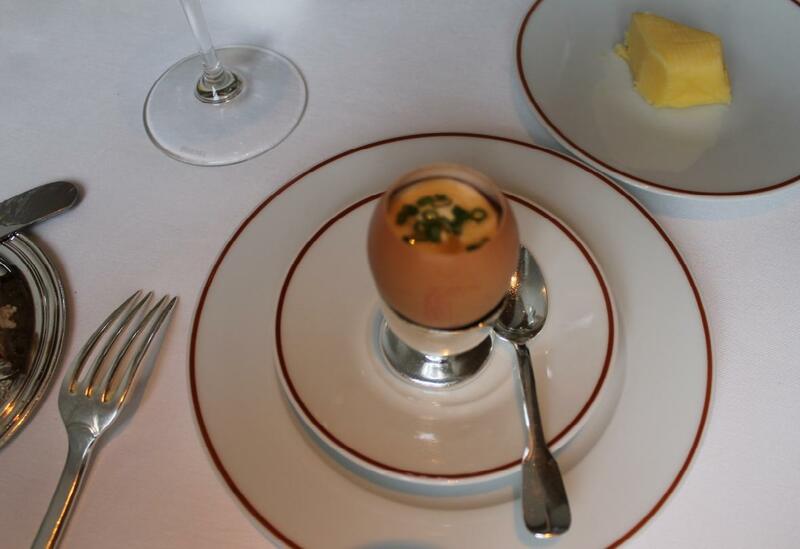 Call it the way you want, but it is a ‘cuisine d’auteur’ in which the brigade tries its best to interpret Alain Passard’s soulful vision of classic French cuisine. My admiration for Chef Passard has of course nothing to do with the appreciation of his food (Passard or not, if I value a food item as great or bad, I’ll point it out regardless of who cooked it), it has more to do with the fact that he is among those very few Chefs who are excelling at bridging the past with the present. They have that incredible ability to communicate the ‘uncommunicable”: memory of taste. Last summer, in Milan, I stumble upon another great Chef of this standing: Chef Aimo Moroni. I was impressed to see how Chef Moroni managed to embark his younger Chefs in a genuine mastery of the flavors of ‘yestergenerations’. Which inevitably allows a cuisine that transcends time. There are less and less of them, those real great Chefs, and they are the last chance for the next generation of cooks to become REAL great Chefs. 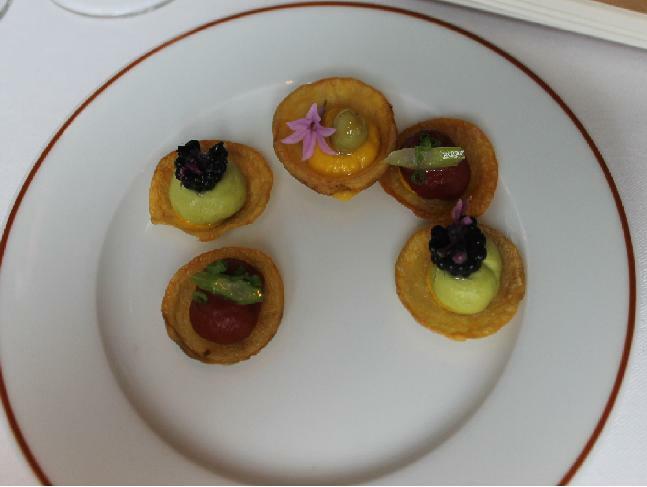 Before the usual vegetable tartlets, the kitchen served a feuilleté of vegetables. 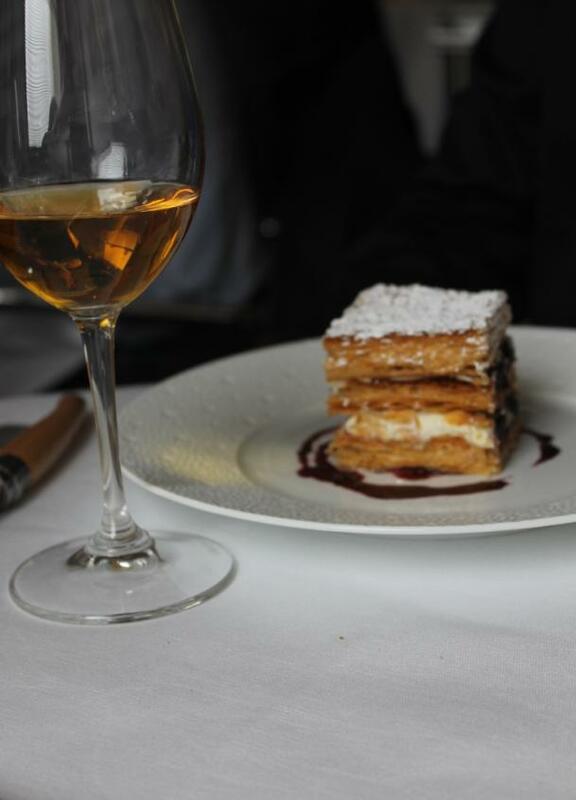 A feuilleté with superb airy texture and sublime buttery taste. Carrots,thyme and peppers were the star veggies of that feuilleté. Then sushi legumier (sushi of beet ). If you are going to make sushi crumbles easily like this, better do something else. Then, their legendary fines ravioles potageres. I read about comparisons with Chinese wonton soups, but If you cook both versions (Passard’s recipe is easy to find online) you will quickly realize that they have nothing in common apart the fact that they are boiled pastas. The ultra refined al dente pasta (another thing that you’ll realize when trying to replicate this recipe is the amount of patience and long practice that is needed, even by professional cooks, to get to this level of precise refinement of both the stock and the texture of the pasta ) is a work of world class precision, and again that is what I call fabulous creativity (not many kitchen brigades would think about proposing ravioles the way they are doing it). The pastas were stuffed with seasonal vegetables, the one with beets tasting really of beets…but the others we were trying could have been whatever vegetable we would want them to be and it would not matter because they had no distinct taste. 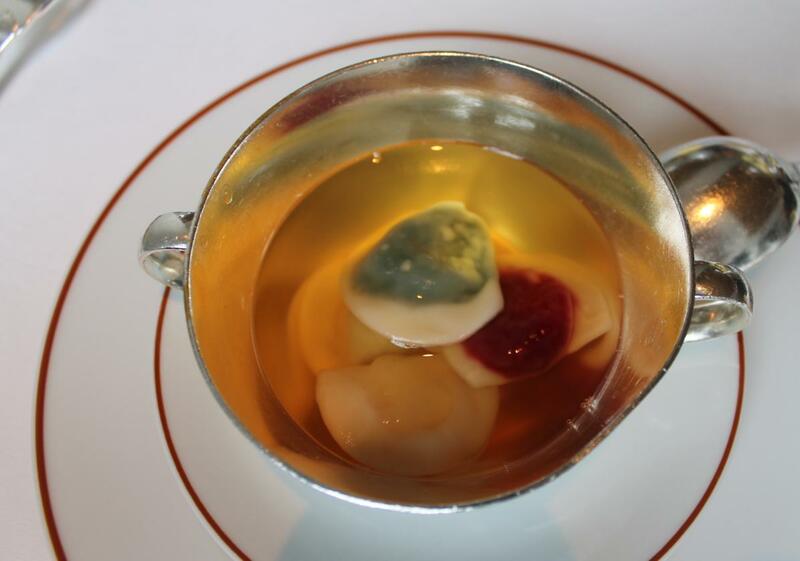 Furthermore, the taste of the broth (parfum de Melisse, on this instance) was one of such aggressive minerality (like a tisane high on mineral aromas, which means not a pleasant tisane) that I found this dish hard to enjoy. 5/10 (Still, keep in mind that this broth and the content of the ravioles varies a lot depending on the seasons, so there are chances you’ll stumble upon far more enjoyable ones). Things then took the direction of the finer dishes of this meal: my wife’s T-bone d’agneau de Lozère aux feuilles de figuier, aubergine à la flamme (roasted T-bone of lamb — the image on the left or above, depending on your web browser’s display settings) would be a crowd pleaser at a world class steakhouse (fabulous taste) and my piece of pigeon/cardamom was a benchmark beautifully rosy (ideal doneness) bird with exciting taste. 8/10 for the lamb, 10/10 for the pigeon, but scores will never be high enough to convey the real great pleasure that my wife and I were having with both the lamb and pigeon. Exciting. Also, ppl talk a lot about the beautiful dishes at l’Arpege, and we were eyeing at an example of just that: the way my wife’s dish was constructed was of unusual supreme visual appeal (hard to tell when looking at that pic, but definitely easy on the eyes in reality). 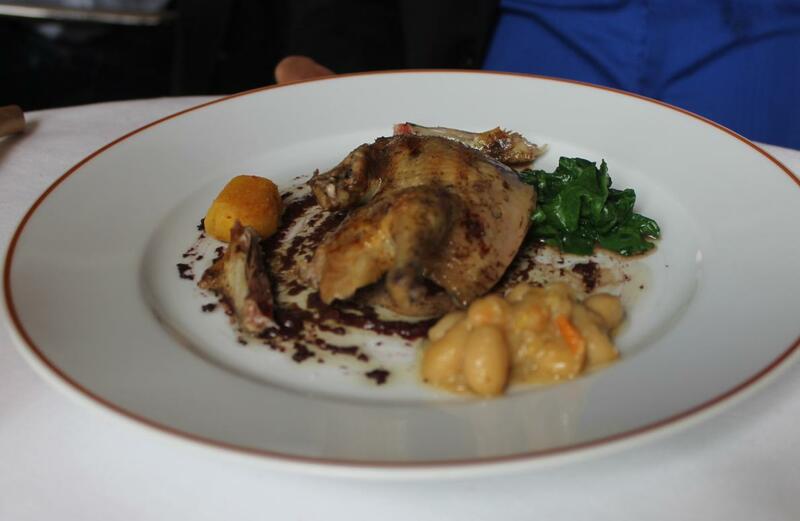 The pigeon came with white beans that had such an amazing mid eastern flavour profile. To end the meal, a well kept aged Comte from Maitre affineur Bernard Anthony and a superb piece of moelleux du revard. Then their millefeuille (blackberry ,thyme) which is indeed light and an enjoyable alternative to its classic version (7/10), and a rework of the classic ile flottante that showcased a creative mind but which, for me, suffered from strong coffee flavour (6/10). My wife observed that the classic ile flottante fared better. I personally do not mind this creative take, but it was just difficult to cope with the strong coffee taste. Pros: the young and dynamic sommeliere from the Czech republic. Her wine suggestions by the glass were so inspired (2)The superlative delicious pigeon/lamb/corn risotto, benchmark creative takes on the gazpacho/red pepper velouté. All items that many will pretend to be able to easily deliver, but few will really reach out to the depth and deliciousness of those. Usually, when there are lesser impressive items in a meal, my overall impression is affected, but not in this case. Here my overall impression had just the finest dishes in mind (3)the very approachable and genuine Maitre D’ Helene Cousin. The wine service: A section that I add to my reviews when I am very impressed by the wine service at a restaurant. The behaviour of the sommeliere from the Czech republic was admirable in all possible aspects: being able to listen, share, never contradicting while making her point whenever necessary, etc. But all of that was done way better than what passes as the norm for great hospitality standards (Helene Cousin also excels at that, but in the different role of the Maitre D’). 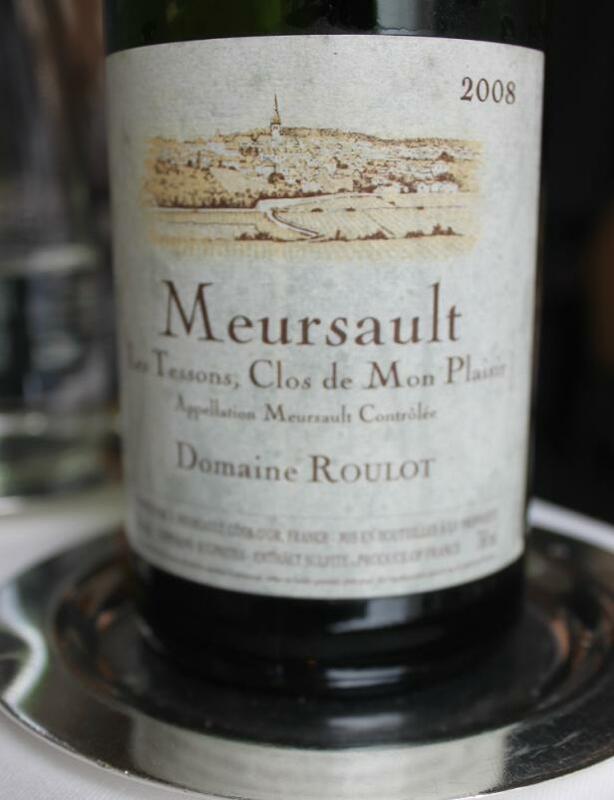 Right upon perusing the wine menu I knew I’d pick the 2008 Meursault ”Tessons, Clos de Mon Plaisir” from the domaine Roulot. She had other choices in mind for me as she pointed to amazing little gems that were less expensive and indeed of great quality. But I went with what I had in mind for the most part of this meal, and she never interfered. A first great classy act from her part. This Meursault is a type of Bourgogne blanc wine that I highly enjoy for its balanced acidity/minerality, enticing nose of ripe fruits, great level of intensity/complexity. It will continue to age well, there’s no doubt about that, but it’s already a top flight flacon). Me chosing that Meursault was also a trap: was my sommelière going to be passive and not flag wine/dish pairings that made no sense (it is surprising how many sommelier/e/s even at highly regarded restaurants do fall into that trap)? NO she never fell into that trap! She is a very present/focused/competent sommelière as she tactfully intervened whenever necessary. The way she did that and the suggestions she had is about the difference between a great sommelière (which she is) Vs a standard sommelier-e. For me, a great wine pairing has nothing to do with showing off pricey wines. It should be about finding, even among the more affordable ones, the wines that turn into true gems because their pairing to a specific dish is flawless. It’s exactly what she did. A world class sommeliere. Service/Ambience: Professional. The younger waiters and waitresses looking very serious, though their youth and energy makes the whole effect not heavy (as in way too serious). Maitre D’ Helene Cousin truely embodying the concept of L’Arpège — which is the theme of a ‘maison de cuisine’, a house imagined by Alain Passard where he receives his guests in a cosy environment (which explains why you do not have the huge space between the tables / grand luxury, etc…of most of the grand restaurants of Paris) — with cordial and yet professional demeanour. I like this approach of being genuine/approachable (The sommelière from the Czech Republic also followed this approach faithfully) since it reminds us that, after all, the most important is that the customer is there to have fun. The only suggestion I would have is that the gentleman who served most of our meal needs to be a tad more chatty in his description of his dishes. All in all, they are French, I am French, so communication was naturally flawless. 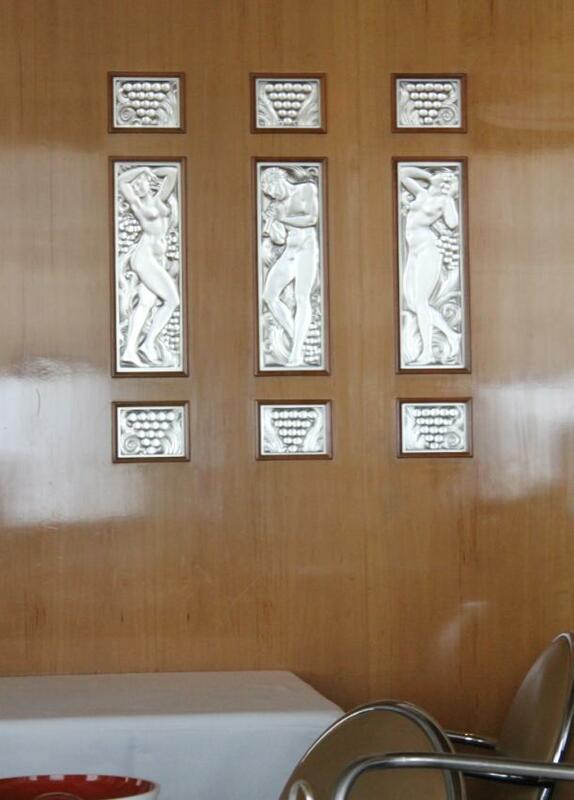 Decor: The interior decor is oftently described as understated. But this place is all about details, so the idea, as Chef Passard has widely explained to numerous medias, is to replicate the ambience of a house. Thus, no grand formal luxury, but the apparent understated warmth of the art-deco inspired home that Passard has imagined for his guests: pear tree wood panels (designed by Jean-Christophe Plantrou) sparsely adorned with few of his paintings, some glass etching works, some retro style chrome-armed chairs, ebene de macassar material (this material is elementary in classifying L’Arpège interior deco as Art deco). 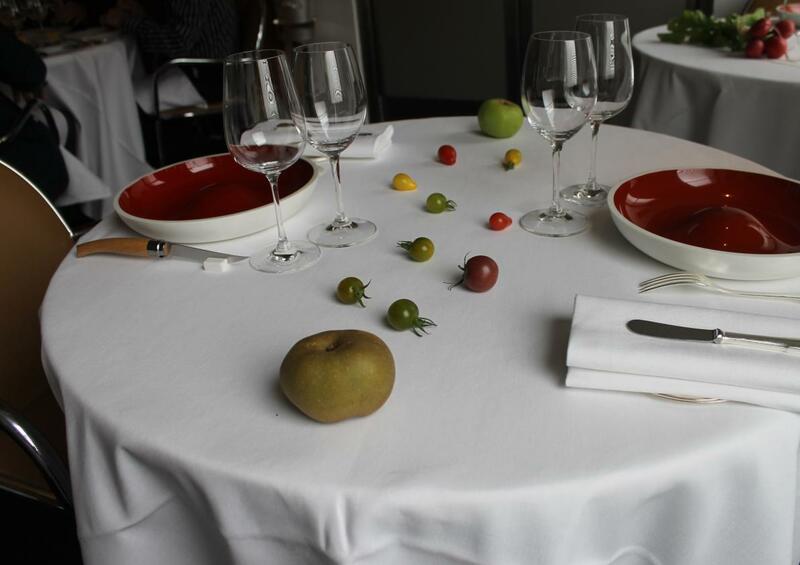 Passard replacing the usual flowers on the tables, by vegetables. Overall food rating (by the highest Classic French 3 star Michelin standards): 8/10** I was immensely impressed with the best dishes of this meal which were so inspired and had such high impact (on my palate) that the lesser items were long forgiven (though, not forgotten…which is the sole reason I am not giving a 10/10 to this meal. Trust me, I am tempted to give that 10, Lol.. but have opted to remain rational)! There are always restaurant meals which finest dishes are impressive, but this one was something else. 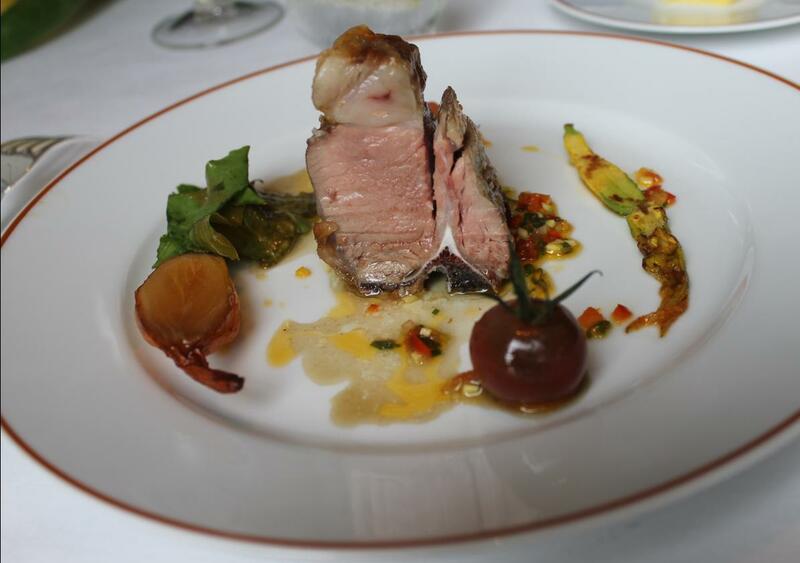 The heights of this meal, for their benchmark joyous flavors and superb creativity, will rarely be paralleled. As with any restaurant meal that impresses, I do not know if L’Arpège can do this all the time. All I know is that the best dishes of this meal I just had, are …. true benchmarks, by any top dining standards and will be remembered as long as my memory serves me right. 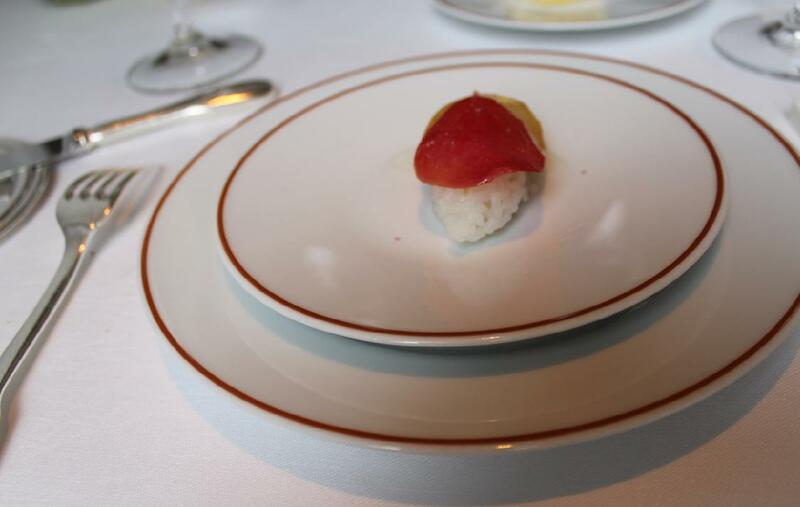 It is rare that an 8/10 meal delivers dishes far superior to a 10/10 meal (for eg, a flawless high level meal but with no particular heights) and this was one of those rare cases. 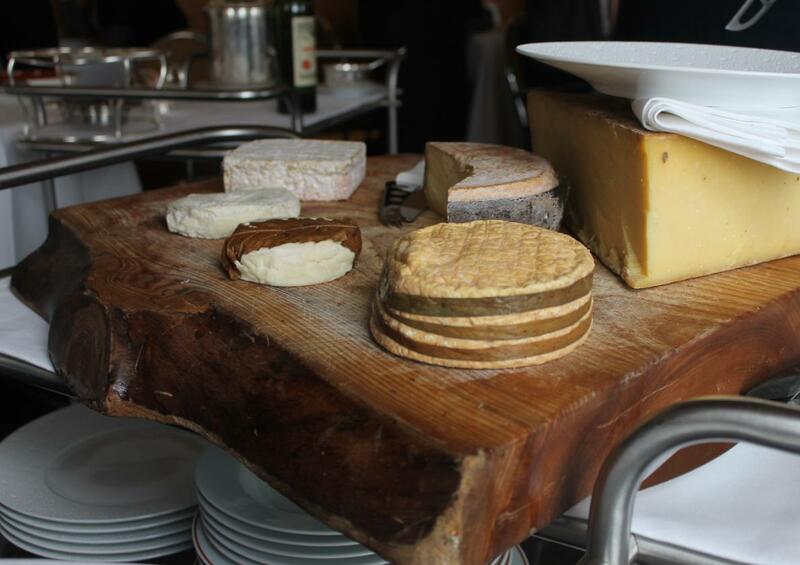 Soul satisfaction ***Two months after this meal, I raised the score of my lunch at L’Arpège to a 10/10. It might sound controversial to assign a perfect score to a meal where many items triggered indifference from my part (the amuse bouches, the ravioles potagères, just to name a few), but at the end of the round, and with hindsight, I was left with a much more important reflection: even among world’s very best, few Chefs have the exceptional palate found behind the finest dishes of that meal (referring to the incredible heights of deliciousness of the better dishes that they’ve cooked. And where many would reproduce those simple looking food presentations only to end up with items of ordinary effect (which happens a lot because many kitchen brigades/cooks simply can’t make the difference between EASY vs SIMPLE), L’Arpège offers plenty of inspired touches to admire for those with an eye for details. If such heights would have been the norm I’d play it rough (referring to the lesser dishes), but is is not. It is not the norm. It is NOT! What I like the most with L’Arpège is that they have opted to be different (from the conventional fla fla of luxury dining), NOT for the sake of just being different because it’s trendy, BUT because they truly are. Conclusion: I prefer a table that does not rests on its laurels like this one, rather than places where everything is uniformly done well but without soul/inspiration. 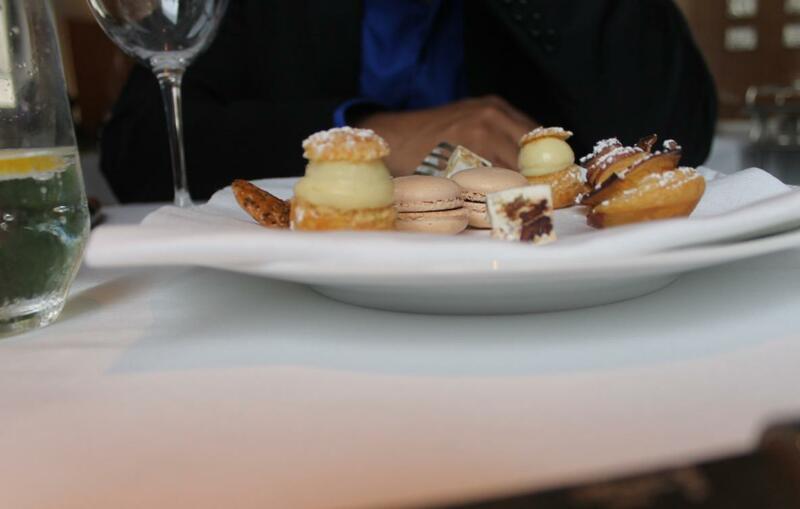 The better dishes of this meal were true moments of divine ‘gourmand’ enjoyment. I’ll also add this: for me, being creative is doing things the way few are thinking about doing them. The way they have thought their ravioles (that level of finesse in creating those ravioles and the thought they did put in working its taste – the fact that I did not like it substracts nothing from the true creativity of that dish — ) has nothing to do with what most ambitious kitchen brigades would think about doing with a bowl/some pasta/some vegetable and water in their hands. The gazpacho, the corn risotto, the red pepper etc..same thing: easy sounding creations that tons of kitchen brigades can do, BUT rarely with this level of utter refinement, attention to details, and superlative work of the taste. For something safe all the way, which is not my thang, this meal (I judge meals, not restaurants) was obviously not perfect. But if for you, the higher highs can potentially …potentially, I wrote…rise to benchmark levels (the case of this lunch), then this would be a standard bearing one. My wife argued that despite the benchmark lamb/pigeon and the fact that she highly regards this place as one of world’s finest (especially for its refreshing and successful different approach of French/Cosmopolitan cooking), an 8 over 10 will be an accurate score for the overall food performance of this lunch. I think that when your higher highs are far better than restaurants of your rank (which was the case on this lunch), then you deserve a 10/10….but way too many items left me wanting for more on this lunch (lobster, ravioles potageres, arlequin Robe des Champs), which in the end leaves me with the 8/10 as a fair overall score (update November 2013: a score that has NOT stood the test of time – SEE my addendum, written in red, to the overall score section ) . More importantly, L’Arpège continues to rank among the stronger 3 star Michelin destinations around the globe, one of my few favourite. Added in October 2013 – What I think a month later : I purposely add this section to all my reviews because there’s of course different stages of the appreciation of a meal. There is the ‘right-off the bat’ stage which is obviously the freshest impressions you have, then of course what you think about it later on. Some people think that you should always wait before unveiling your thoughts about a meal, which to me is akin to manipulating reality. It’s one thing to think for a while before making an important decision, but if talking about the appreciation of your meal does require some second thoughts, then I am afraid you are just sharing a portion of the reality. What you’ve read before was my fresh impressions. What you’ll read next is where I stand a month later: that meal at L’Arpège could be perceived as a crash or a triumph depending on who you are as a diner. A crash if you think of a restaurant as that robot who’s supposed to read in your mind and feed you with the exact bites you want, which I think would be a naïve approach to dining. A triumph if you understand that a meal needs to be judged on the back of the heights it can reach, not in terms of this is good, that is less good and that is a bit better. 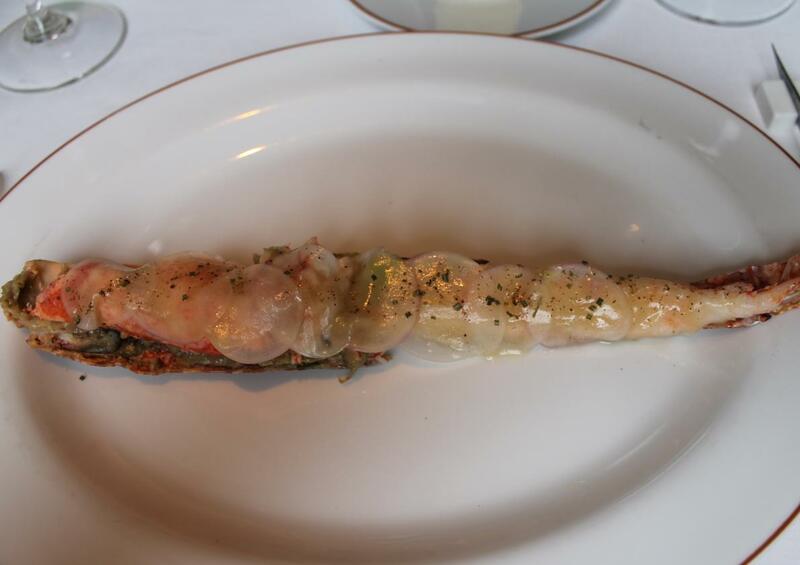 Then, there’s also this important observation to make: there’s a reason some restaurants deserve their 3 star Michelin rank (needless to stress that for me, this is a strong 3 star when it ‘’touches the sky’’’ as it did on that meal). And that reason is the same that makes a Porsche, a Lamborghini or a Ferrari all well praised cars: the details! If for you a Porsche is simply an assemblage or metal, nothing more, then do not bother with it! You are losing your time. 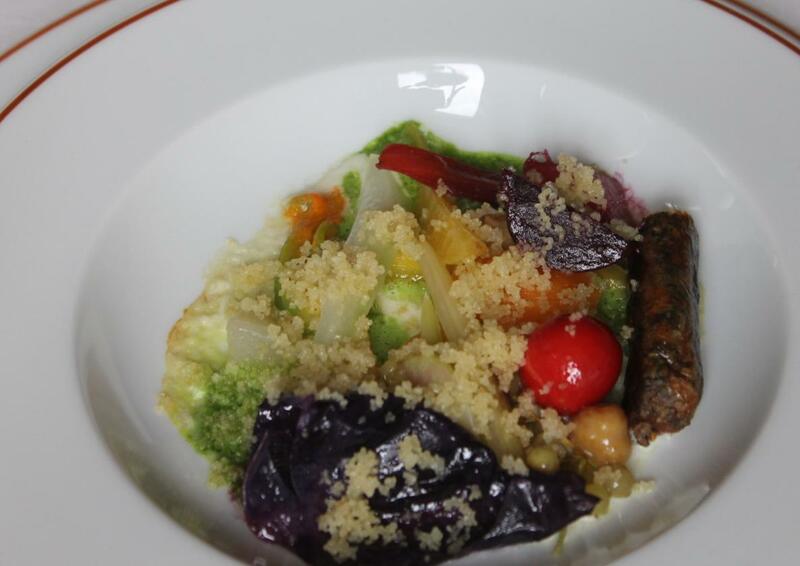 Same thing for this meal at L’Arpège: if for you that Arlequin of legumes is just a take on the couscous, or those ravioles are just interpretations of wonton soups, please do yourself a favor: stick to the numerous canteens you won’t fail to find on your way. Leave those to people who can appreciate the details / thoughts that were invested in those dishes. I do not mean to sound rude by saying so, just pragmatic as you’d want to constructively tell to anyone who can’t properly appreciate a great song in its full nuances to simply stay away from it. Despite how easy as it sounds (upon reading many reports about their cooking), what I was sampling takes, in facts, a lot of training, efforts and skills (it’s one thing you not like a dish, it is another thing to trim it down to what it is not) . When this brigade at L’Arpège performs like it did on this meal (referring to the finest dishes of this meal, obviously), the analogy I’ll consider is one related to sports, the 100 metres race: this brigade powered through the finish line when many of its peers are still at the starting blocks.